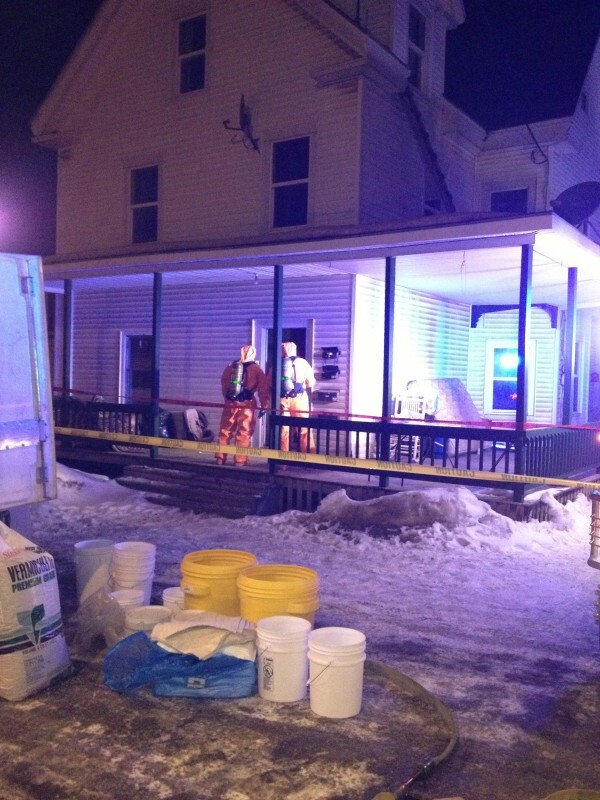 The Maine Drug Enforcement Agency arrested and charged three people with trafficking in methamphetamine and endangering the welfare of a child on Tuesday, Jan. 29, 2013, after executing a search warrant at an apartment house at 60 Military Street, Apartment A, in Houlton, pictured here. HOULTON, Maine — Three people were charged Tuesday with trafficking in methamphetamine and endangering the welfare of a minor after the Maine Drug Enforcement Agency searched a home on Military Street. Darrell Crandall, MDEA division commander, said Wednesday that the MDEA’s lab team executed a search warrant at an apartment at 60 Military Street following reports of criminal drug activity and strong chemical odors. There also were reports of children living in the apartment. Crandall said that agents arrived Tuesday morning to interview Jammie Dickinson, 27, of Houlton, and Kyle Stewart, 25, of Houlton. A toddler also was present at the time. Based upon the reports to police and observations made during that visit, all occupants of the apartment building were evacuated. Crandall did not say how many people lived in the building or were evacuated. Houlton police officers and MDEA agents secured the property while other MDEA agents obtained a search warrant. On Tuesday evening, MDEA’s lab team entered the apartment and agents seized chemicals, solvents, equipment and other materials used to make methamphetamine. Agents also seized strips of lithium metal, a highly flammable component of methamphetamine, that were hidden inside a child’s shirt near where the child sleeps. Stewart and Dickinson were arrested, according to Crandall. Also arrested was Crystal Dehahn, 26, of Hodgdon. All three were charged with trafficking in methamphetamine, a class B crime, punishable by up to 10 years in prison and a $20,000 fine. All three also were charged with endangering the welfare of a minor, a class D crime punishable by no more than 1 year in prison and up to a $2,000 fine. Crandall said the agency believes these three suspects are primarily responsible for the criminal activity at 60 Military Street, but that a number of other people have been interviewed and additional arrests are possible. The Maine State Police provided assistance during the investigation. Members of the Houlton Fire Department and the Maine Department of Environmental Protection also were on the scene providing support. During 2012, MDEA’s lab team processed 13 methamphetamine manufacturing sites in Maine. Eight of those sites were in Aroostook County, according to Crandall.